Notes: Turner F23. 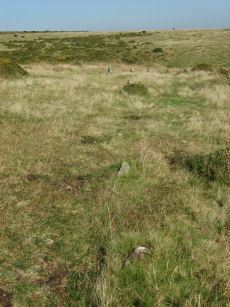 The remains of a stone row and cairn on Brent Fore Hill. The row is crossed by two leats, one of which is now disused. 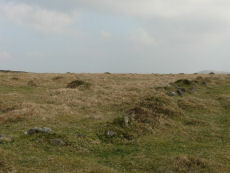 The cairn is visible as a low mound of turf-covered stones of 13.5 metres in diameter and 0.3 metres high. 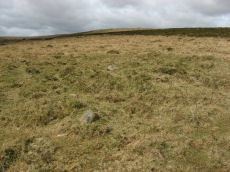 Photo shows 2 or 3 stones of the cairn - it is not very photogenic! Notes: Close to the Corringdon Ball Chambered Tomb is a complex of multiple rows and numerous multiple ringed cairns. 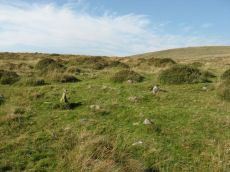 Notes: Five monuments noted by robinson and greeves at the ne end of the stone rows. Many have multiple concentric circles of small stones. Includes 3 cairns. 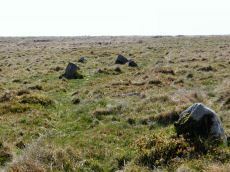 See also entries for Corringdon Ball Stone Rows and East Glazebrook Encircled Cairn. Lethbridge p.82-3. 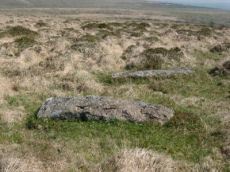 Notes: "Corringdon ball stone rows. 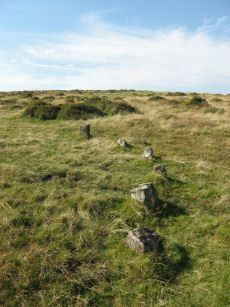 Six or seven rows of small stones approximately 75m long, terminating at the east end in a small semi-circular stone setting of five stones, none more than 500mm high, and the alignments are irregular - they run along the contours. 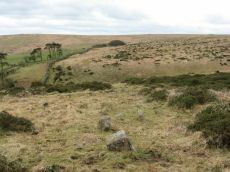 Situated on the open moor between the east and west glaze brooks. 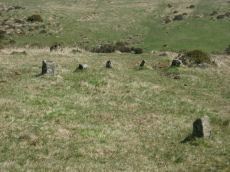 A complicated set of stones which can only be aligned into rows by exact survey. The direction of the rows is approximately south west". Described by R H Worth as two triple rows B & C. See also HER 14802 (Corringdon Ball B). Notes: Cairn at east end of the Corringdon Ball group of multiple stone rows . Six pillars of the retaining circle are clearly visible. For more detail see entries for the Corringdon Ball rows. Notes: Butler Hickley Ridge 3 56.14.4 diagram Vol 5 p.176. "Cairn and cist on the East side of Brent Fore Hill. 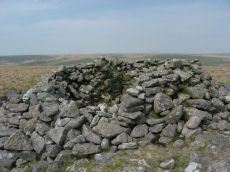 The cairn is 6.0m in diameter, merging into the slope of the hill and being about 0.5m high on the downslope side, which has a retaining kerb. 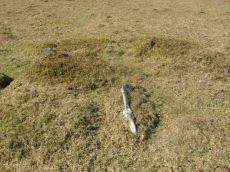 There is a central cist of which two parallel slabs remain set on edge at the NW and SE sides. 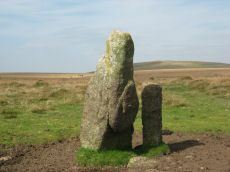 An upright stone 0.9m high is offset from the cist on the NW side." Lethbridge p.84 diagram and photo top left. Notes: Turner A54. "This large cairn (24m diameter, 1.7m height) composed of loose granite boulders. 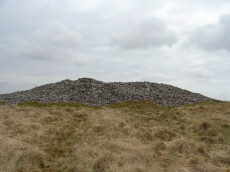 It is unusual among summit cairns in having a well defined outer bank about 1m wide and 0.5m high. This is partly turf covered but where eroded can be seen to be built of loose stone like the central cairn which touches it. It shows best on the north and east sides, while on the south west side it tends to merge into the body of the cairn. " Notes: A rectangular enclosure not far from Corringdon Ball chambered tomb measuring 112m by 34m that can be seen clearly on aerial and satellite photos of the area. The walls are up to 1.5m thick and 0.3m high, and have been entirely destroyed on the east and north-west sides. There is no obvious entrance and the interior is empty of any structure. According to Butler the east to west orientation of the long axis could suggest a mortuary enclosure of mid-neolithic date (Vol 5 pp.155-6).